We’ve been reviewing Deepcool products for some time at Vortez, but it’s been a while since we’ve examined one of their computer chassis. Over the last few years, the company has unveiled a rather interesting selection of products one of those being our review subject in question! In the spotlight today is the New Ark 90. First announced at CES earlier in the year, New Ark 90 is a full-tower enclosure which breaks out of convention by supplying a pre-installed liquid cooler straight out of the box. 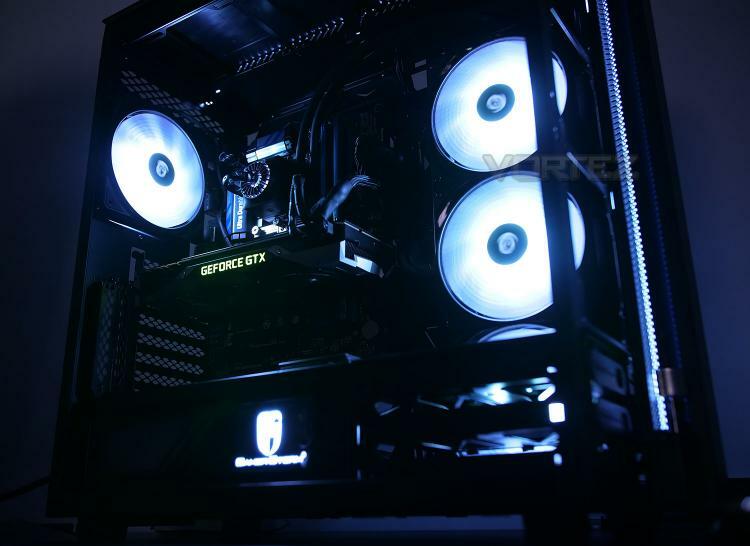 Deepcool has paired this case up with their well-known CAPTAIN series solution, boasting a 280mm radiator and accompanying 140mm RGB cooling fans -this unusual inclusion could simplify the build process for many enthusiasts. New Ark 90 carries with it a large feature-set and seeks to break out of the norm with many of its attributes – but is it a step too far? Read on to find out! The Deepcool NEW ARK 90 is an E-ATX case with integrated liquid cooling with visible external flow systems, designed for users with a special preference for water-cooling solutions for their rigs. NEW ARK 90 completely eliminates the conventional technical barrier between DIY water-cooled towers to provide users with the perfect user experience. The tower is a perfect integration of extreme minimalist designs, glass panels, and RGB lighting to provide a unique visual aesthetic. Internal compartments offer excellent expandability and compatibility. The NEW ARK 90 comes with 4 independent cooling slots, dominating its competition by allowing users to easily create their personalised water-cooled rig.